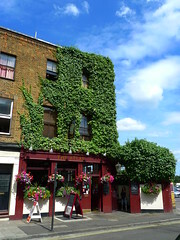 A gastropub within sight of the Earl's Court Exhibition Centres and around the corner from West Brompton Station. This pleasant pub just off the main road is attractively bedecked in ivy with plenty of attention paid to appearances. Inside, what was once a two room arrangement has been opened out into a long space, but still retaining a lot of the original wooden interiors including the vestiges of a partition wall halfway down (including frosted glass). Seating is solid wooden furniture on wooden floors, and there's more seating outside in a beer garden running the length of the building, with a separate entrance to the street. The bar offers four handpulls for ale, with Adnam's Lighthouse (£3.80/pint), Doom Bar, Landlord and London Pride on offer on Ewan's May 2012 visit. They also have Pilsner Urquell (£2.50/half-pint), Peroni, Beck's Vier, Staropramen and Aspall's cider, amongst other more usual options. However, clearly the greatest attention has been paid to the wine menu, which runs to two tightly-packed sides on the laminated menu cards left on the tables, and is also prominently displayed on chalk boards around the bar area. Food is served noon-12:30pm and 6pm-10pm Mondays to Fridays, noon-4pm and 6pm-10pm on Saturdays, and noon-10pm on Sundays. The menu looks to be packed out with gastropub-style options, with mains priced around £12-£15. On a Wednesday evening visit, the place was nicely filled up both inside and out and clearly attracts plenty of local workers (as well as, one presumes, crowds when there is a show on at the nearby Earl's Court). Child-friendliness: According to their website as of August 2012, children are only allowed in before 7pm. Accessibility: One shallow step to get into the pub, but no steps to the beer garden entrance. Last visited by Ewan and Kerry, May 2012. Opening hours and food times taken from website, June 2012. Last edited 2013-05-10 06:43:11 (version 7; diff). List all versions. Page last edited 2013-05-10 06:43:11 (version 7).